Former Arsenal star Jack Wilshere had to be comforted by another ex-Gunner Lucas Perez as he made his return to the Emirates Stadium for the first time this afternoon. Having left Arsenal for West Ham this summer after 17 years in the Gunners’ academy and first-team, it’s clearly an emotional day for Wilshere as he prepares to take on his old club. 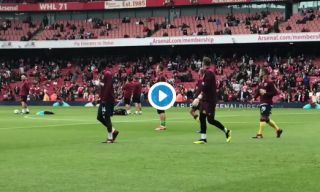 Wilshere can be seen in the video below taking in his surroundings and looking slightly over-awed by the occasion as Perez comes over to comfort him on his way off the pitch after the warm-up.